It’s kind of crazy to think about how many firecrackers like this you can find in the archives of the record label ECM. 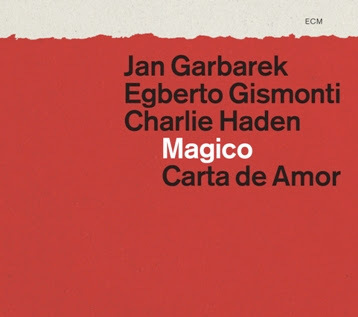 Not long ago it was a live recording from 1979 with Keith Jarrett’s European quartet where Jan Garbarek was a member which was brought into daylight. And now: another live recording with Jan Garbarek has been dug up. He is playing with piano player and guitarist Egberto Gismonti and bass player Charlie Haden. They did some very important records in 1980 (Magico) and 1981 (Folk Songs). Records, which fused Norwegian and Brazilian contribution to the world jazz and free jazz together. Here they are on stage in Munich in 1981. Before this concert they have been touring with their music in two years and they know each other well. They are three strong individuals, and maybe too strong for this album? A few places they melt together as a team, but often one musician will shine the most when there is room for a long solo and room there is. That’s when I find they sometimes sound as if they were standing in different parts of the world, each musician playing for himself. The sound is amazing, though. Jan Erik Kongshaug has mixed the original, analog recordings.